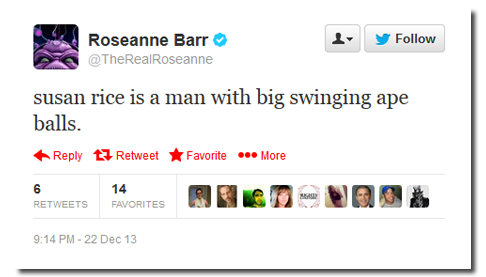 Roseanne Barr is perhaps one of the strangest characters on the scene today. The one-time Green Party presidential candidate has since seen her politics evolve into somewhat of an unholy alliance between alt-right and ultra-Zionism. She has also been a vocal supporter of one of the worst presidents this country has ever experienced in Donald Trump. Last month, Barr made front page headlines as the reboot of her show Roseanne was cancelled due to a racist tweet she sent out in which she referred to half-black Obama White House adviser Valerie Jarrett as the daughter of an ape. She blamed the tweet on the fact that she was supposedly on Ambien when she wrote it. If it’s true that racism is an unlisted side effect of Ambien, someone should get on that- and fast. Prior to her vile statement, Roseanne was doing surprisingly well. Though they were steadily dropping after the pilot, the show was consistently one of ABC’s most popular. The day after she lost her show, she spoke with a reporter at the Jerusalem Post about her current situation. In the recently surfaced interview, Barr can be heard tearfully uttering the words “I lost everything” when discussing the cancellation. It is natural to feel bad for someone in a seemingly vulnerable state, but I urge you to fight this instinct in this instance. For starters, she, plainly, hasn’t lost everything. She still has her fame and fortune (she is worth an upwards of $80 million). Furthermore, she has no one else to blame for the termination of her sitcom but herself. I believe that everyone deserves a second chance, but this was not Roseanne’s first mistake- not by a long shot. Her Valerie Jarrett tweet was emblematic of the wider trend of hateful rhetoric coming from her Twitter account which included retweets of alt-right and neo-Nazi accounts. For example, she retweeted a post that compared Islam, and by extension all Muslims, to Nazis and Nazism. Or what about this Jewish supremacist tweet in which she vocalizes her desire for the vast majority of UC Davis students to die by incineration? And last but not least, to bring things full circle, here is her comparing another black, female, Obama adviser to an ape. Though she has cleaned up her act to some extent following the public outrage, her Twitter feed is filled with this garbage. My point in all of this is to say that the Valerie Jarrett tweet was not some innocent slip-up. ABC turned a blind eye to this stuff for a while and the tweet that lead to her show being cancelled was more of a last straw than a watershed moment. It’s a wonder she got a show in the first place. In short: Don’t feel bad for Roseanne.